I LOVE this look! 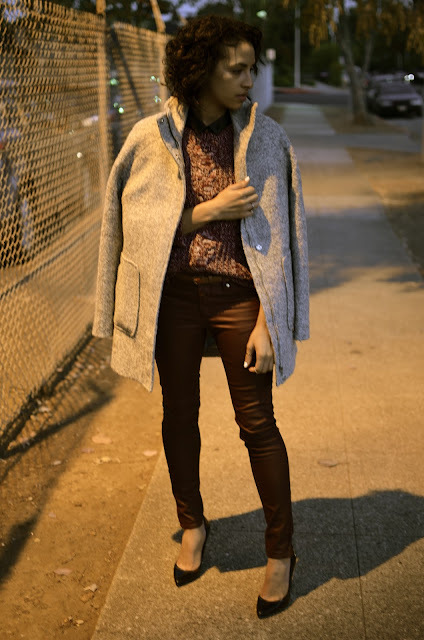 You are killing the fall colors and the layers are oh-so-fab!! Yay for style challenges!! BRILLIANT! This color is absolutely stunning on you! Girl, you are looking so hot! LOVE those pants on you! Great fall colors ensemble! Beautiful, Carlina! Those pants are fantastic and the night shots are stunning!! Love the amazing color of those pants! Now following. Amazing look:) I really love this pants!! Like the subtly monochrome look. A neat vibe. I love those pants! Featured similar ones in a post a few weeks back! You look amazing in them! Love Nicole Richie's new line at Macy's! Love your outfit too! This is SO perfect to pair with a scotch tasting! It's rich and warm just like the drink. Genius. I've been hunting for an oxblood sweater! Your pants look so luxe! In love with oxblood! :) And how cute is the detail on your collar! Simple yet chic outfit! Love it so much!!! I love this look classic and chic!! !